I never know what to wear to work when it's warm outside. I always wear black tights and something to cover my arms but sometimes it's just too warm. I picked up this dress in Peacocks a few months ago and this is the first time I've worn it. It's long enough to wear without tights but I feel a little on show on my top half.I added the belt which I picked up in a pack of three from Primark and my favourite shoes from Tuk. Not entirely sure that it is work appropriate or totally flattering yet. I'm rather excited because I booked a trip to Paris in September! I have only booked the Eurostar so far and wanted some of your advice on where to stay. Have you ever stayed at a budget hotel or hostel in Paris? I would love to hear some of your recommendations. 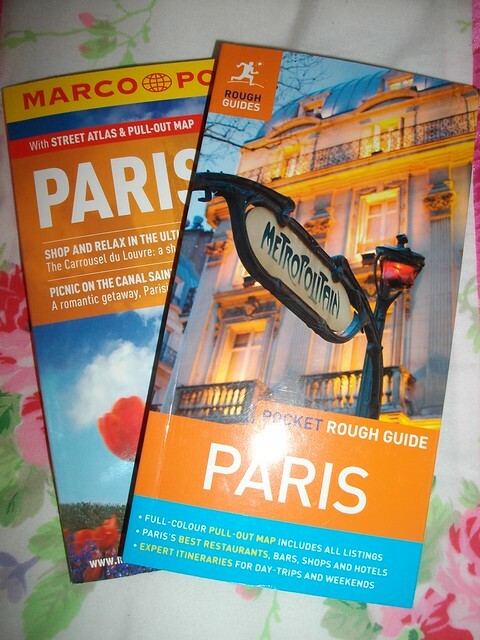 I picked up these guides on sale in WH Smith and worked myself up into a frenzy about where to go and what to see. I'm going for three days so I can fit quite a lot in. I'm planning on eating lots of lovely macarons, visiting the Louvre(free for people under 26 on Friday nights) and hanging around in Shakespeare and Company. I'm going to frolic around like I'm in À bout de souffle, I can't wait! Are you enjoying the sun or planning a summer getaway? p.s. 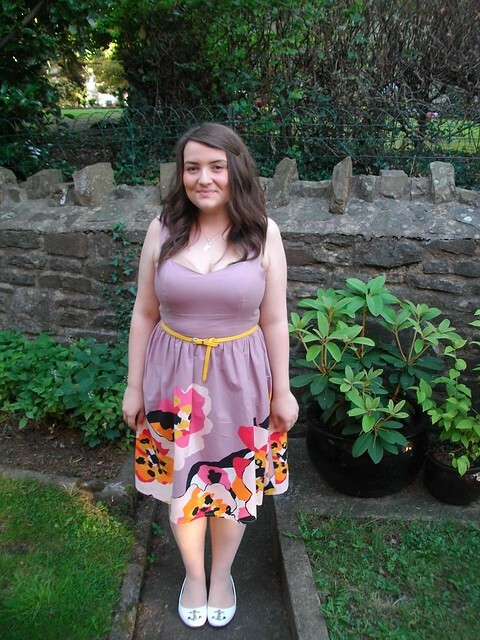 there is a giveaway running on Where Are My Knees and I'm selling clothes size 16-22 on eBay for Paris funds. I have black tights on again today, feel bare without them! oooh lovely, thanks for the tip! So long since I've had a fab ice cream! I've never been to Paris so I'm afraid I can't suggest anything but it's somewhere where I've always longed to visit! I love this! And deffs think it's work/weather appropriate. 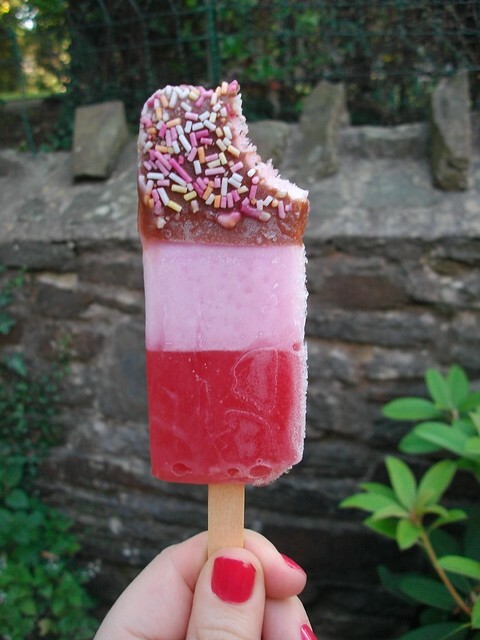 Gah you've made me want to get fabs. The dress looks lovely! I agree about finding something work suitable to wear in this weather though...nightmare! So excited for your Paris trip, take lots of photos! looking forward to going home so I can have another fab lolly :) totally addicted. The dress is really pretty and totally flattering!! You look really gorgeous! 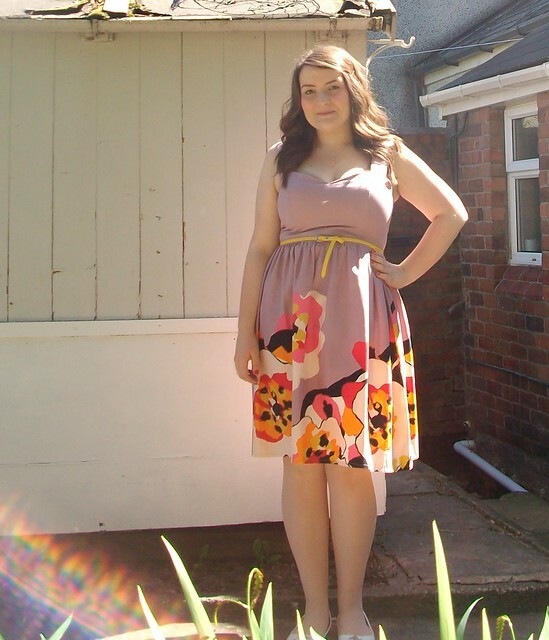 I've been reading your blog for a while now and am commenting for the first time to say that I LOVE this dress on you! It's super tasteful and cute while not being frumpy at all. As much as I love the tights and a sweater look, it can be very dowdy in the warmer months and I'm so pleased that you're feeling confident enough to go without them. Keep up the good looks! I have the same work wear nightmare. I always wear black tights to work, I am so stuck in the sunshine! Love this dress, I definitely think it is flattering. Gorgeous colours. That dress looks lovely! I'm never good at dressing for work when its hot, I don't like going without tights and hate having my arms on show! Ooh Paris, how exciting! I'd love to visit one day! Lucky you off to Paris :) Look on booking.com I stayed in a the Best Western Etoile Saint Honore and for the two of us it was €240 for 2 nights and you get free breakfast, and supper (Ham,cheese,salami, cold pasta etc)from 5-8 and it's only a 3 minute walk from the Champs Elysees. I've also stay near Bastille(still pretty central)in the Campinile and it was only €70 a night, which in Paris is great. If you need anymore questions, I'd be happy to help! You are getting so teeny tiny miss! That dress is gorgeeeouuus. yay for gay paris! i wnt about 8 years ago so cant remember where i stayed, but it was the most romantic beautiful city... the latin quarter is so beautiful and used to be cheap to eat out there and really full of life. Sounds like you had such an amazing time! I would have loved to of run around spreading glitter with you :)!!! mba research papers When you can’t get your papers done it can be very stressful and we understand that, which is why our MBA papers writing service is here to help you in your time of need. bachelor thesis this combined with the writing meant that I struggled to meet deadlines and often compromised on the quality of my work just to get something submitted on time. press release services If you are a businessman looking for a company to write a press release for you, then you have come to the right place. Our company is a fine custom press release writing company that provides premium quality services at reasonable prices. We possess knowledge and experiences necessary to provide you with a flawless press release right on time. Our professional writers and editors know everything about press release writing and are eager to produce a state of the art document that will cater to your exact needs.